← Is the Pebble “people’s” Smart watch the future Business Model? Is email overload driving you insane? “Always-on, multitasking work environments are killing productivity, dampening creativity, and making us unhappy. Addressing information overload requires enormous self-discipline. A little like recovering addicts, senior executives must labor each day to keep themselves on track by applying timeless yet powerful guidelines: find time to focus, filter out the unimportant, forget about work every now and then. The holy grail, of course, is to retain the benefits of connectivity without letting it distract us too much”. 7 deadly sins of email that we’ve all fallen guilty to. If you are you suffering from the torrent of messages hitting your mailbox then there is a potential solution to help you deal with “attention fragmentation”. “28 hours – Time each week spent by knowledge workers writing e-mails, searching for information, and collaborating internally. 20–25% – Potential improvement possible in knowledge worker productivity. Two-thirds of the value creation opportunity afforded by social technologies lies in improving communications and collaboration within and across enterprises. By adopting these organizational technologies, we estimate that companies could raise the productivity of knowledge workers by 20 to 25 percent. However, realizing such gains will require significant transformations in management practices and organizational behavior. Social technologies can enable organizations to become fully networked enterprises—networked in both a technical and in a behavioral sense”. There is no audio but interesting facts and features. “The benefits of lightening the burden of information overload—in productivity, creativity, morale, and business results—will more than justify the effort. And the more we appreciate the benefits, the easier it will be to make new habits stick”. McKinsey also state that we need to Focus, Filter and Forget. I think sanebox fits the bill. As I stated in a previous blog the Fitbit One can help an individual lose weight. 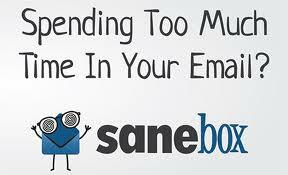 If you want / need to manage your email habit then maybe the Sanebox solution will help restore your sanity. There is a free two week trial so you can try before you buy. Alternatively you could write letters or notes for the important stuff. Paperman is an awesome new Walt Disney animation which takes us back to a bygone age when messages were conveyed on physical paper. “Introducing a groundbreaking technique that seamlessly merges computer-generated and hand-drawn animation techniques, first-time director John Kahrs takes the art of animation in a bold new direction with the Oscar®-nominated short, “Paperman.” Using a minimalist black-and-white style”. I have been addressing from the tooling angle, but I think the problem is so big that it requires three approaches in parallel: first decrease the number of emails by changing email habits and by switching to social media where possible; second, increase people’s efficiency in dealing with email; finally improve the tooling to automate as much as possible of the email processing. This is what our product, Tagwolf, does.